At ALA Midwinter 2015, eight members of the Niles Teen Advisory Board were selected to participate in the Best Fiction for Young Adults Session on Saturday January 31, 2015 along with other lucky teens from Chicago area libraries. As a qualifying element to participate, teens posted reviews of books on the BFYA list to the Niles website. Some of the teens had also participated in the BFYA session in ALA Conference in Chicago in 2013 so the teen librarians had many excited motivated readers who wanted to join the team. All the teens were superstars at the ALA Midwinter session with their presentation and reading. After the fun of the presentation with excitement high the idea was presented to the Niles team to initiate a Niles Teen Tournament of Books for National Literature Day in April. The teens had read and reviewed a great number of books for their participation at ALA so they had a head start on reading and reviewing. At the March Teen Advisory Board meeting books were picked and judges assigned. Teens in high schools in our district were contacted and other teens joined the members of the Teen Advisory Board. Eleven teens volunteered for the tournament and twelve books from the BYFA list were chosen. Each teen judge read and reviewed two books and then picked their choice to go on to the next round of reading and reviewing. Dates for each bracket were assigned but with AP Exams, Spring Break, spring sports, exams and graduation parties the Tournament extended from spring to summer. This fall the second Annual Tournament of Books featuring the Abraham Lincoln Award Nominees and Read for a Lifetime Reading Lists will offer more reading fun for Niles teens. The Teen Department recently acquired six Kindle Paperwhites and the complete 2016 Abraham Lincoln Book Award and 2015-2016 Read for a Lifetime Reading lists will be uploaded to the devices. The thirty teens who are signed up for both reading programs along with the over twenty teen advisory board members were contacted to join the tournament. At the September Teen Advisory meeting books and judges will be chosen. 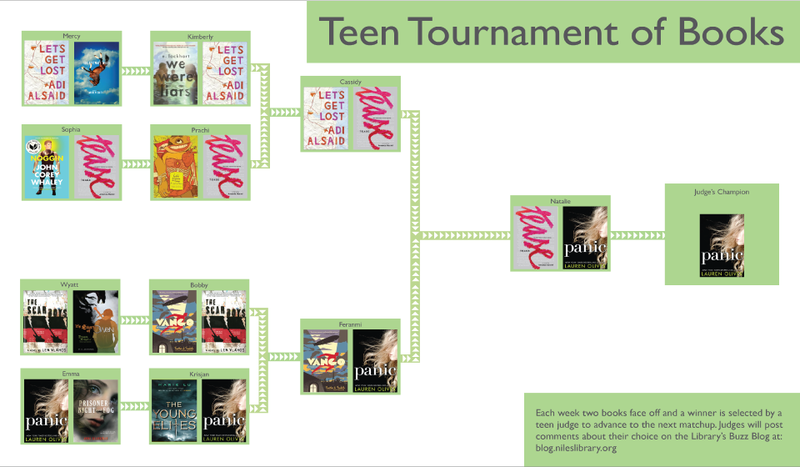 This tournament will run from Teen Read Month in October to Teen Literature Day in April – plenty of time to read and review two books. The game plan is to post the Tournament on the Niles Website on Teen Literature Day during National Library Week 2016. 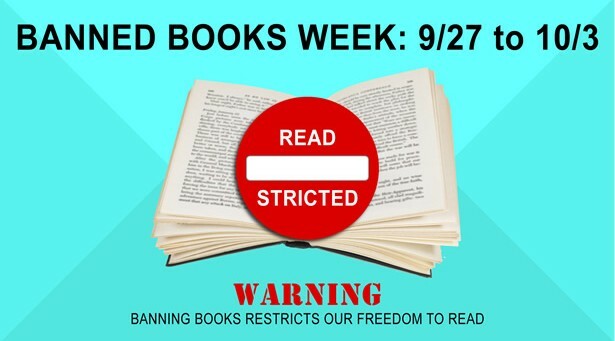 Books can captivate, bore, or face flinging against the closest wall. This winter take your mind off the weather, lift your spirit and follow the YASF 2015 Tournament of Books. Since a lot of area teen librarians have never experienced serving on a Printz committee the Young Adult Services Forum of the Illinois Library Association thought it would be fun for teen librarians to express their thoughts on what YA book merits the title BEST.Last year fifteen librarians participated in the 2014 YASF Tournament of Books voiced their opinions on the merits of 16 books and picked Out of the Easy by Ruta Septys. The 16 books for the 2015 list were chosen from a list of 36 nominated titles from YASF members and were ranked according to starred reviews. The first round reviews are due Wednesday, February 11, second round on Wednesday February 25, third round on Wednesday March 11 and fourth round on Wednesday March 25. The winning book will be announced Thursday March 26. All reviews will appear on this blog.The plan is for the winning author to visit YA day at A Library State of Mind Conference on Saturday October 24, 2015. In Just One Day Allyson Healey is the good girl who has always followed the program of her parents. Everything her parents want she wants. 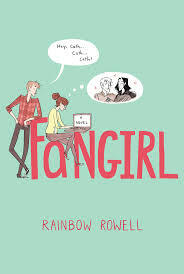 This novel is relatable to the huge universe of teens with helicopter parents. Her depression following the Paris episode is understandable and her lack of joy at the beginning of her freshman college year heartbreaking. How Allyson comes to life with the friendship of Dee and her Shakespeare class progresses the story well. Although this is a coming of age story is it above all else a romance, a passionate love story. Willem is everyone’s first love. Out of the Easy is all heart. “Josie girl, she got a heart like an artichoke. A leaf for everyone.” When I first read this book last summer I cried at the end. Rereading it for this review, on Fat Tuesday for true atmosphere, I again cried. I am such a sap for sad endings. I loved the characters. 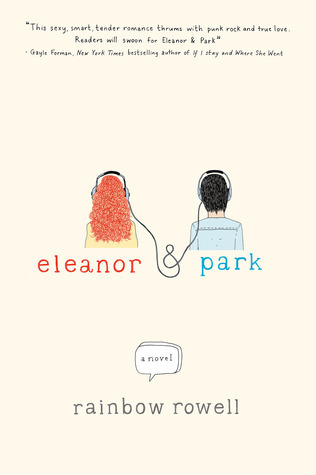 I loved the spunkiness of Josie, her concern for Charlie, and her quest for a college education. The banter between Josie and Willie was hilarious yet touching. The villains in the story are so slimy. Her poor excuse for a human being mother is pure evil and Mr. Lockwell made my skin crawl. Ruth Sepetys can write! She has crafted a historical fiction novel that captures the Southern charm of the city of New Orleans with all its highs and lows. Rising above the typical tired tale of a madam with a heart of gold she has written a novel with unique characters with a setting so strong you can envision every scene. Heart wins over Passion. My vote is for Out of the Easy by Ruta Sepetys.